I was able to ski the Blossom Race Carve SL size 166 on Thursday both in the gates and free ski. I liked them free skiing more than in the course, because they are bit softer than typical race slalom ski. The softer, smoother flex is a big plus for a ski in this group and someone looking for a little more laid back version of a slalom ski. the Blossom's are just a ton of fun on both steeps and flatter pitches, they do want to turn, but i found i could make some longer turns without the skis getting to jittery. The Race Carvers will reward you for proper technique and power with a lot of rebound after you un-weight to the next turn, and allow for a few mis-ques that a stiffer world cup slalom would punish you for. nice clean graphics . A very fun ski, that could be an everyday ride for hard groomers, and a pilot looking for high performance, short turn carver. Quality is 9. Professional fit and finish. 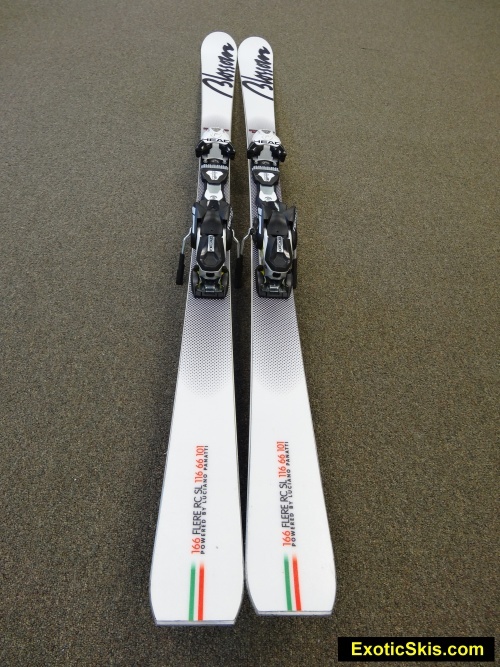 Blossom is the continuation of several companies making skis in Chiavenna Italy for decades. The Persenico name has been associated with great Italian skis since 1906. 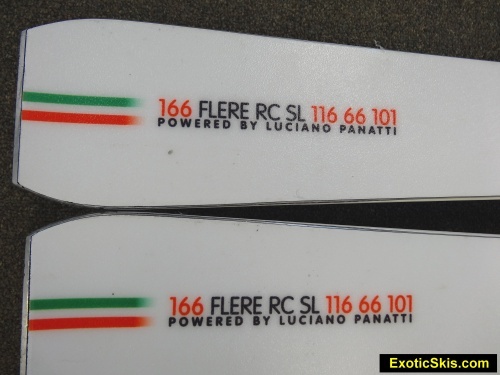 Luciano Panatti, trainer of the Italian National Team, rebooted the factory as Blossom in 1999 and has been producing World-Cup skis and civilian models ever since. 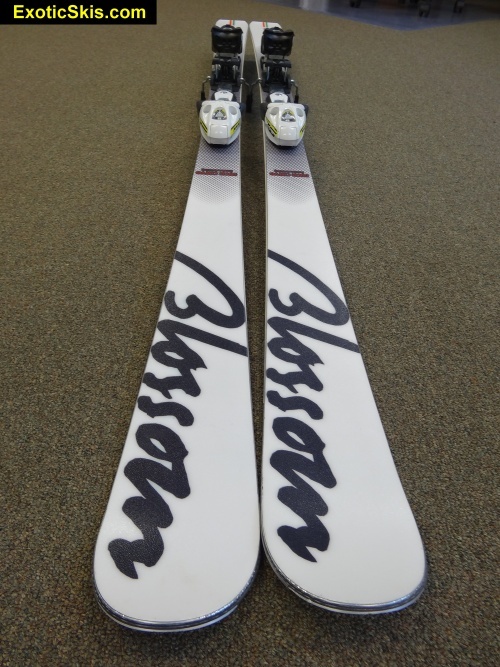 Blossom is rumored to make skis for Olympians who favor the Italian ski construction and designs and make arrangements to put "big brand" name topsheets on their creations...rumor of course... The stellar reputation of Blossom's skis is widespread and well-deserved. A small factory of only 12 people produce these skis, and the experience and expertise of the ski builders in the valley has been handed down for generations, making this one of the hotspots of ski construction in the World. The Blossom factory also does a fairly brisk business producing custom-branded skis to other designer's specs (such as VIST and others). This factory knows skis and knows how to make them seriously for top athletes around the World. They traditionally have a damp, controlled behavior, utilizing titanal metal in most layups. 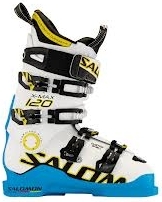 "Designed for technically advanced skiers, but non competition. 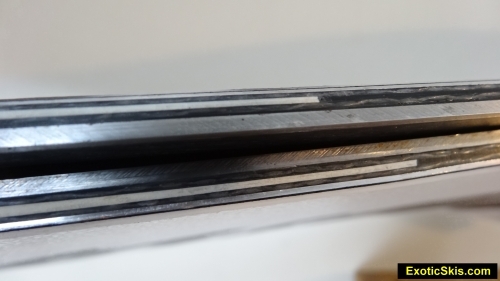 Skis which incorporate precisely the same construction and physical characteristics as racing skis, but are rather more adaptable and flexible with a central core which facilitates stability and reduces vibration. The main objective – to provide a perfect equipment guaranteeing exciting sport for the determined skier to enjoy." 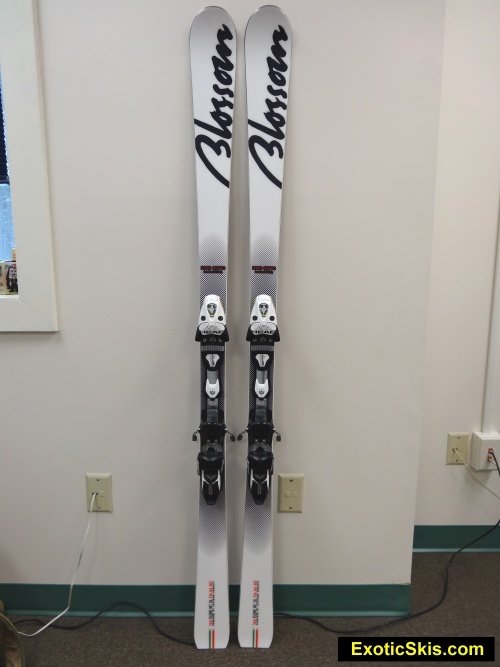 The Blossom Flere RC SL is a narrow, ice-loving, nimble and easy-handling jackrabbit of a ski that has a passion for a J-shaped turn with lots of zing on the tail, but is easy and fun to ski, as long as you don't get in the back seat...or it will run out from under you. This is not a race ski, but a detuned slalom racer meant for hardpack surfaces only. Packed powder is realistically too soft for this ski. Ideal for man-made, hard snow conditions. Bite bite bite, but without any burliness. Contemporary slalom geometry. Narrow profile, damp response to "hand gong" test, "metallic" feel, fairly light weight. Handsome looking, simple graphics with anti-scratch topsheet. Eastern corduroy, packed powder groomers, ungroomed packed powder with small bumps, boot-deep powder. Windpack, crust, icy death-crust, chalky wind buff, dry powder, eastern boilerplate, frozen granular. The Flere RC SL bites immediately underfoot when you apply pressure. 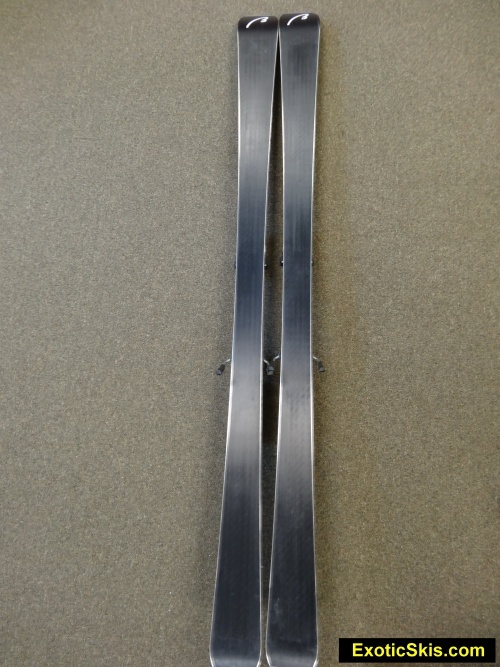 If you have been riding predominantly 85-120mm waisted skis and get on this 66mm ski, you will be shocked and excited to rediscover the thrill of having infallible edge grip underfoot on icy surfaces and the ability to make instant direction changes on-demand. The Flere RC SL has no hint of bury, racer-only feel. It is light and easy handling, and quick as a rabbit underfoot. Punch it and it changes direction "RIGHT NOW", but not without control. The vibration dampening works very well to keep it quiet on the snow, especially harder surfaces (the kind that make a lot of noise when you ski on them), but yet allows a surprising amount of pop and zing off the tail when weighted that way. While you can roll this ski on and off its edges left and right to create tight carves into the surface, I found the Flere RC SL was happiest when punched and weighted, launching itself into the next turn. The roll-em-and-ride-em style works, but the happy-zone of this ski appears to be underfoot and in the tail, and when you exercise those portions of the ski, it zings from one turn to the next. This is not a heavy, damp machine designed for tracking through icy ruts at mach-schnell, but a lively, pouncing type of ski for fun slalom carving, and it does it very well. I found the ski to demand you pay attention, since if you get lazy and let your position in the turn get behind center, you end up with the skis out in front of you and your center of mass back behind yourself. This is addictively fun, and can wear you out if your technical skills are dulled. GS-like cruising runs are fun, as long as you stay centered. 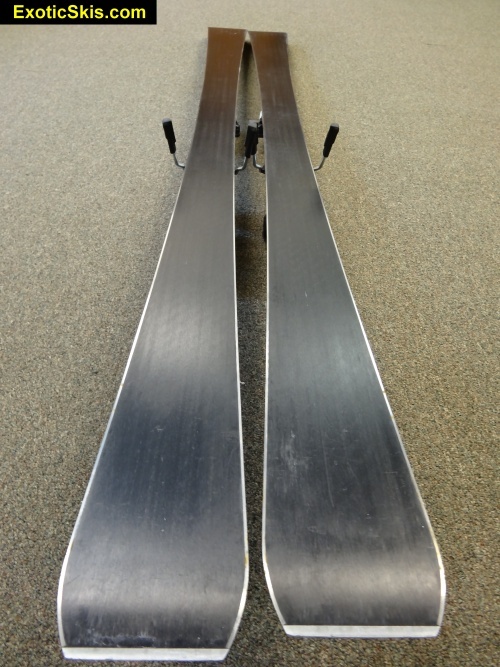 This ski was only 166cm, and at 66mm underfoot, is not a big platform to ride at high speeds. The fast, wide turns are quietly held without vibration or chatter, just don't get back on your heels, or the quick, short ski might not be where you want it for your next transition. Pay attention at speed...but then again, this is for slalom speeds, not GS-cruising speeds. The Blossom Flere RC SL craves the hardpack and delivers a sporty, endlessly zingy ride with intense grip underfoot. The relatively forgiving flex of the Flere RC SL, being a detuned slalom racer, makes it pretty easy in mixed conditions, as long as it does not get too deep. The 66mm waist is indeed narrow and will sink and retard your forward momentum if you press it too deeply into the surface in mixed conditions. It will pop and change directions in a quick, agile manner, allowing you to navigate nearly any obstacles without much effort. Impacts are absorbed nicely, and it never fights you unless it sinks below the surface and can't come back up (e.g. deathtrap ice crust). You can ride the ski in mixed conditions, but with the huge selection of mid-width all-mountain skis these days being so very good at cutting crud and mixed surfaces without flinching, the traditional slalom carver seems somewhat crude in such conditions. It is not an "all mountain" ski, unless your mountain consists of groomers and hardpack. 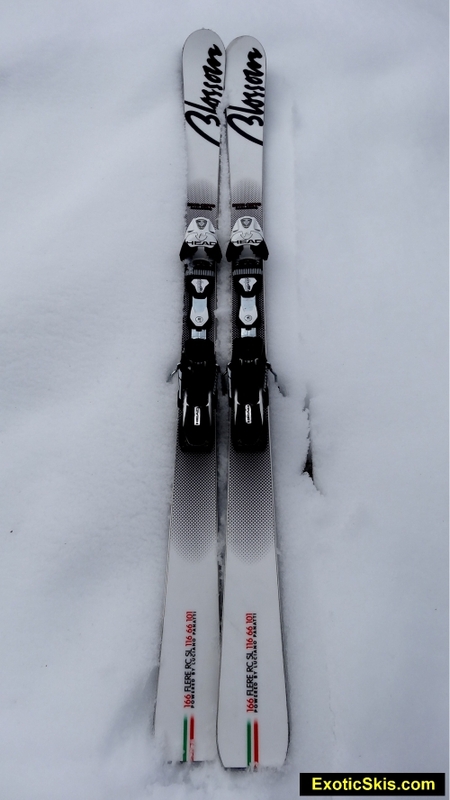 The Blossom Flere RC SL is lively and nimble in the bumps (at least the small ones we could find), but beware of pushing its flex limits too far since it is a ski with a significant amount of metal in it, and you could deform it. No lack of power and pop, and it lets you pick your placement on the tops, sides, backsides or fronts of bumps on-demand without a fuss. This 66mm waisted ski is really no fun in powder. Case closed. Leave this ski at home if you have more than two inches of fresh snow. The Flere RC CL can cruise at high speeds fairly quietly due to its good vibration dampening and stable grip, but its short length and jackrabbit-like response and turn tendencies force the pilot to pay attention at speed, or suffer an unexpected deviation of direction of one or more skis. Because of its narrow waist, if you are motoring at high speed on the hardpack and hit a soft section of snow, it will decelerate very quickly as it sinks in...so watch it. This is a slalom race carver, not a GS or all-mountain ski. This ski is really very nimble in tight terrain, and surprisingly quick when asked to change directions. As long as the surface is two-dimensional, you can change direction immediately without effort. If the snow is deep enough to sink-in, you will find the ski agile, but requires some effort to get it out of its rut. Again, it's a slalom carver, not a pivoty, surfy ski for tight conditions. I might change the geometry slightly to engage more forebody of the ski in its turns since if feels like all the action happens underfoot and in the tail, but that might be the exact reason people love this ski's behavior....so let's not change it. This is a classic example of a European slalom race carver for hard snow usage. Quick, nimble, intense edge grip and lots of pop, and built to last several seasons of hard use. You would be hard pressed to find something more fun to ski when the conditions are bulletproof. Be sure you want a race carver and not a race ski. This is not a racing ski, but a detuned version of a racing model. Get your reflexes in shape too. You're gonna need them.